Occasionally when one is searching the Internet for a specific purpose, an unexpected result will turn up. That is exactly what happened to me yesterday; as I was searching for a specific document (the 2003 decree of recognition of the UIGSE-FSE) I came across the doctoral dissertation (“Global Citizenship Education”) of Eduard Vallory. 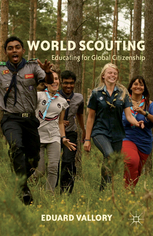 Dr. Vallory is the author of the book World Scouting: Educating for Global Citizenship, a book that is alternately edifying (such as when the history of the scouting movement is recounted) and enraging (such as when the author refers to non-mainstream scouting associations as “fake scouts” without ever defining the term* — the Scouts of Europe seem to be singled out for particular opprobrium). I am not so sure there was a nefarious plot by the Holy See to find a scouting association that was more amenable to Church control than the ICCS! Equally disturbing is the idea that the ICCS (which was once known as the International Catholic Scouters Conference) accepts the authority of “World Scouting” (that is, WOSM/WAGGGS) over that of the Catholic Church. In what way does such an organization have a claim to the title “Catholic”? If one’s highest authority is something other than the Church Christ founded, then one isn’t Catholic at all, but something else entirely. But (in charity to the ICCS) perhaps Dr. Vallory is reading something into the ICCS Statutes that isn’t there. §1. In the Church there are associations distinct from institutes of consecrated life and societies of apostolic life; in these associations the Christian faithful, whether clerics, lay persons, or clerics and lay persons together, strive in a common endeavor to foster a more perfect life, to promote public worship or Christian doctrine, or to exercise other works of the apostolate such as initiatives of evangelization, works of piety or charity, and those which animate the temporal order with a Christian spirit. In other words, any private association of the faithful is “an instrument of the Church.” Ironically, this is the same status that has been accorded to the ICCS! So perhaps the UIGSE-FSE is simply more open and honest about its purpose. 1.2.12. In a country where several Christian confessions exist, scout or guides units belonging to the various Churches or Communities may cohabit within a same association, each group welcoming the young people belonging to the same Church or Community, according to the norms of the Rules. A scout’s honour is to be trusted. A scout is loyal to his country, his parents, his leaders and to those who depend on him. A scout is made to serve and save his neighbour. A scout is courteous and chivalrous. A scout sees in nature the work of God: he likes plants and animals. A scout obeys willingly and does not half do things. A scout controls himself: he smiles and sings even under difficulties. A scout is thrifty and takes care of his own possessions and those of others’. A scout is pure in his thoughts, his words and his acts. One can see that this version of the Law has a more explicit link with the work of Lord Baden-Powell than the one in use by the mainstream UK scouting association. Of course, as can be seen in the link given above, other mainstream scouting associations also use a version of the Law that has only a sketchy relationship with B-P’s version. On my honour, I promise that I will do my best to uphold our Scout values, to do my duty to the Queen, to help other people and to keep the Scout Law. I promise that I will do my best: To be true to myself and develop my beliefs, To serve the Queen and my community, To help other people and To keep the Guide Law. To do my duty to God and the King. To help other people at all times. On my honour, and with God’s grace, I promise to do my best to serve God, the Church, my country, and Europe; to aid my neighbor in all circumstances; and to observe the scout law. In short, the UIGSE-FSE is hardly alone in “interpet[ing] the writings and positions of Robert Baden-Powell as it has seen fit” (although it might well be alone in admitting that it is doing so! ); furthermore, the Scouts of Europe have preserved the patrimony of Lord Baden-Powell while mainstream scouting associations are rejecting it. A SCOUT officer came to me the other day with a scheme for organising the Movement on a better footing than heretofore. It involved a certain amount of expense in offices, whole-time secretaries, etc. But there was a plan to meet this with an adequate contribution of funds from Local Associations. An integral part of the idea was the formation of a fully representative committee by general election to manage the whole organisation ; the advantage was that it could eliminate the present sporadic and uneven arrangement of Local Associations running their shows on different lines of their own. In this more centralised and ordered system a far more accurate record could be kept of the development, a more regular standard of efficiency among the Troops could be set up, and a better general supervision maintained. He was going on to describe further advantages of the scheme when I felt bound to save him the trouble, and I burst in on him with the remark, “My dear chap! But you have not got the hang of Scouting. For one thing the Movement extends considerably beyond the United Kingdom. Your elected committee would have to represent all parts of the Empire. How could election supply the expert heads required for the different departments at Headquarters? Local Associations would enjoy subscribing funds to run the office — I don’t think. These are some of the minor material objections. But there is another and far greater consideration that upsets the whole caboodle. WE ARE A MOVEMENT, NOT AN ORGANISATION. Do the above paragraphs not describe some mainstream national scouting associations, and perhaps even “World Scouting” itself? That is, the very existence of an organization purporting to represent the scout movement to the whole world is incongruous with the idea of scouting as a movement. Let’s examine these “requirements” in a bit more detail. 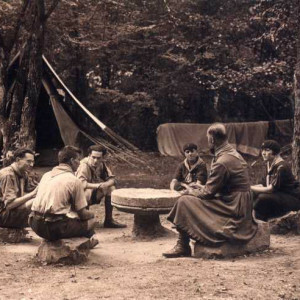 In the early years of the scout movement, there were a number of Catholic scouting associations formed: in France, the Scouts de France (1920), by Fr. Jacques Sevin; in Belgium, the Association of Baden-Powell Belgian Boy and Sea Scouts (1912) by Jean Corbisier; and in Italy, the Italian Catholic Scout Association (1916) by Count Mario di Carpegna. 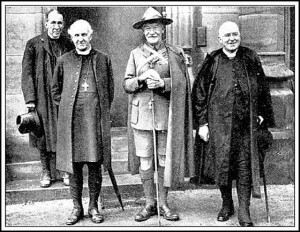 These associations were founded by and for Catholics, so in that sense were not “open to all”; and having preceded the formation of the Boy Scouts International Bureau (BISB) in 1921 they were not “universal.” Yet we don’t hesitate to call them scouting associations; Baden-Powell even lent his name to one of them. So “being open to all” and “the universal dimension,” at least, are not requirements of the scout movement per se, but rather requirements of the organization that perceives itself as the sole authority on what scouting is and isn’t. As far as the requirement of “organizational independence” is concerned, it is difficult to see how something — that is, the scouting movement — that isn’t an organization can have an organizational requirement! The term “scout” therefore was legally allowed to be used by fake scouting against the principles of openness, tolerance and dialog of the scout movement. *However, Dr. Vallory defines a similar term, “false scouting” in his dissertation, and I think it likely that he uses “fake scouts” and “fake scouting” to mean the same thing. Ironically, Dr. Vallory notes [p. 156] that László Nagy (who would later become Secretary General of WOSM), in his 1967 “Report on World Scouting,” categorized non-WOSM/WAGGGS scouting associations as “nonrecognized,” “dissident,” and “exiled and refugee,” but without giving reasons for it.